High Hoops is proud to announce that we are expanding our AAU program. In addition to the Uxbridge location, we will have teams playing out of Hopkinton this fall. Players interested in playing for a High Hoops Hurricanes team must first register online — there is no charge, as our tryouts are free — and then attend the upcoming tryouts. If you are not able to make a tryout but are interested in playing, please reach out to us via our website contact page and we can discuss other options. 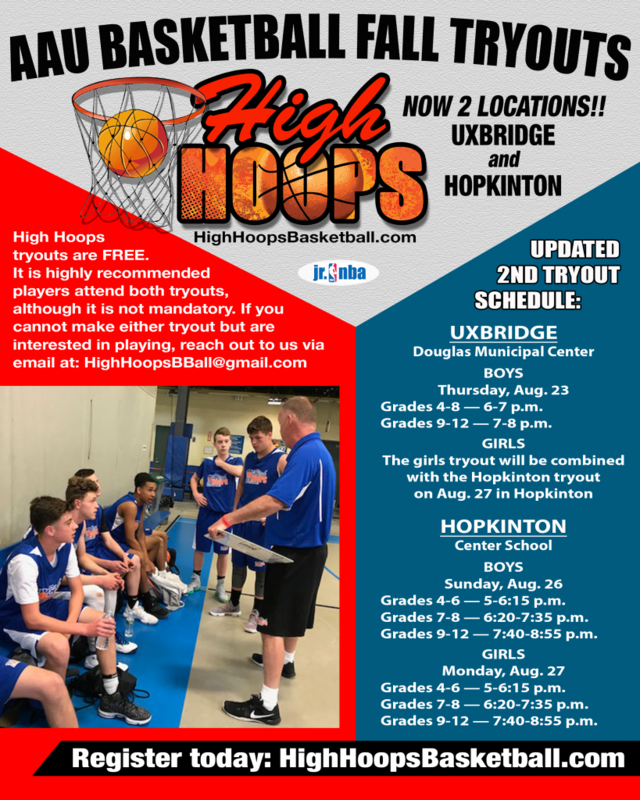 To register for the Uxbridge tryouts, click here. To register for the Hopkinton tryouts, click here. Below is more information about the High Hoops program. High Hoops AAU is open to boys and girls in Grades 4-12, from any town. Below is the updated schedule for the second tryout. Please be at your tryouts at least 10 minutes early so you can check in and we can start on time. Grades 4-8 — 6-7 p.m.
Grades 9-12 — 7-8 p.m. The girls tryout will be combined with the Hopkinton tryout on Aug. 27 in Hopkinton. Grades 4-6 — 5-6:15 p.m.
Grades 7-8 — 6:20-7:35 p.m.
Grades 9-12 — 7:40-8:55 p.m.
Where are the team practices? Uxbridge teams will practice at the Douglas Municipal Center. Hopkinton teams are tentatively scheduled to practice at Center School. When does the season start and end? How many practices and tournaments are there? Practices are tentatively scheduled to begin the week of Sept. 10. There is one team practice per week, with potential for an occasional extra practice. Each team will participate in five weekend tournaments, with the season ending the first weekend in November. We will not finalize the tournament schedule until probably early September, but we attempt to find tournaments reasonably close by in order to minimize the amount of driving everyone must do. Based on past history, most tournaments likely will be about a 30-minute drive from where your team practices, but it depends on schedule and availability and other factors — such as trying to ensure we have competitive games. When do we get the game schedule for the tournaments? Most tournaments send out the schedule 2-3 days prior, so there is not much advance notice. Typically, teams are guaranteed three games — usually two games on Saturday (could be anytime, but generally within a 4-hour time span) and one on Sunday morning, then a possible playoff game or two Sunday afternoon. Some tournament do not have playoffs, so the schedule could be different. It costs nothing to register for tryouts. If your child is selected for a team, the fee is $495, which includes a full uniform (jersey, shorts and shooting shirt). If your child already has a uniform from a previous season, the fee is $445. Who will coach my child’s team? Coaches will be assigned after the teams have been finalized. We have coaches with decades of experience coaching basketball at the youth and high school level, and sometimes we will use a parent coach if that person has the requisite experience and ability. What is the level of commitment expected of players? While it’s obviously preferable that players attend as many practices and games as possible, we understand that everyone has other commitments, including other sports. We ask that you inform us of potential conflicts before the season so we can plan accordingly.